The very first dental references, discovered on clay tablets, were written about 5000 years ago. From that time until the 1700′s, dentistry was concerned mostly with cleaning (using a cloth and some type of abrasive powder or dentifrice) and extremely painful tooth extractions. No local anesthetics in those days! “Treatment” in those days consisted only of extracting diseased teeth. There was no preventative care! In fact, when George Washington became the first President of the United States in 1789, he had only one natural tooth left in his mouth! Sedation dentistry? There wasn’t anything that came even close to that! 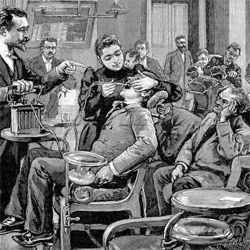 The first dental anesthetics were opium, nitrous oxide, ether and cocaine (really!) which were applied to “numb the pain” during extractions in the 1800′s. Synthetic cocaine, called Novocain (“new cocaine”), was first introduced in the early 1900′s. After that, some of the more “humane” dentistry procedures and techniques came onto the scene. Reclining dental chairs, high-speed drills, better sterilization procedures, and improved dental materials were products of the 20th century dental evolution. Cosmetic dentistry can whiten teeth and change your whole smile, invisible braces have replaced the “metal mouth” look, and remote-controlled televisions and music piped through headphones have certainly increased the appeal of a visit to the dentist! New technology and pain-free dentistry provide a comfortable and relaxing experience. Many of our employed patients schedule appointments during their lunch breaks and even take a catnap while we perform routine dental procedures. Can you imagine sleeping through a dental appointment? We can assure you that you’ll be pleasantly surprised at what Cedric Street Dental Centre has to offer today’s dental patient. So please – give us a call and make an appointment to come in to see us! And we promise – we don’t lecture – even if it has been awhile since your last appointment!